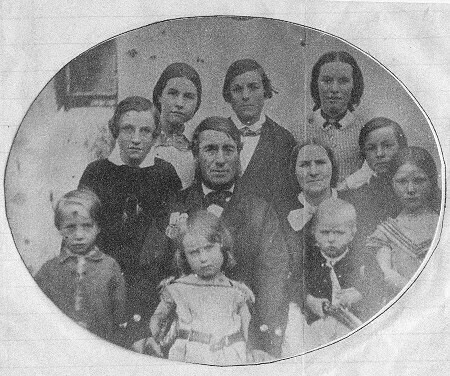 John Vincent Rohu and Family. Born 1813. Married 1838. 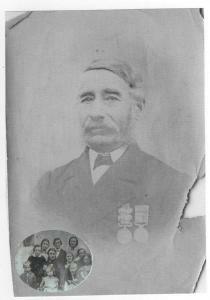 Chief Boatman in Coastguard.Served at Iniscoo, Co.Donegal, Elly Bay, and Achill Island, Co.Mayo, and Malahide, Co.Dublin. Died 1893. Submitted by Roy Rohu, Co.Mayo. do you know what his hat is? or what his medals are? I looked at the original photo and I'm afraid his 'hat' is just a comb-over. The medals are probably too indistinct for identification purposes. However, I'll pass along your question to Tony and he may be able to shed some light on them. Very interested in John Vincent Rohu's photograph. One of his sons (?) Edward applied from Malahide Coast Guard Station for a position in Irish Lights in January 1867. This seems to have been quite common, presumably for sons who did not want to have to serve in the navy . Edward was accepted and later served as Principal Keeper of Fastnet Rock Lighthouse 1896-1901. His son (?) A J (Alf) followed him into the lighthouse service and also served on Fastnet 1917-19 as an Assistant Keeper. I wonder is it possible to identify the family members in the photograph? Here is the original family photo full size, I hope it helps. The medal on the left is definately a Crimea Medal with two clasps, and at a guess the one on the right is a Baltic Medal. Without know on which ship he served it is difficult to say what the two clasps are on the Crimea Medal - one is almost certainly for Sebastopol and the other is either Innkerman or Balaklava. What is strange is that I have done a search of the medal rolls for both these awards and cannot find a Rohu on either, but given the unusual name there is a very good chance that the spelling on the roll is incorrect - it comes back to knowing which ships he served on. After some further research I can now confirm that the medal on the left is a Crimea with Sebastopol and Azoff clasps earned aboard HMS Royal Albert. The Azoff clasp is for the attack on Taganrog in 1855. In 1854 Rohu was on board HMS Prince Regent, where he earned the Baltic Medal. As I suspected the name had various spellings with him appearing twice in the Azoff roll as Rohw and Bohn!